Beer brand John Smith's is bringing its no-nonsense, plain-speaking humour to the Royal Wedding, with the launch of a commemorative paper plate. 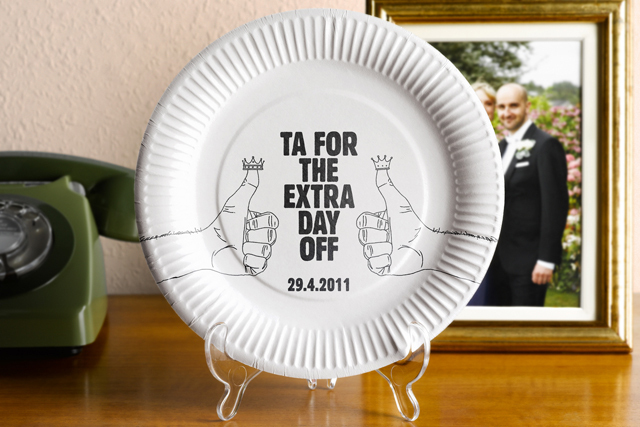 The paper plates have the words "Ta for the extra day off" printed on them, in between two raised thumbs with crowns drawn on them. The limited edition six-inch plates, which have been created by Heineken UK roster agency TBWA/London, are being distributed to leading John Smith's-supplied clubs and bars in the brand's Yorkshire heartland. Punters get a free plate, one of the tens of thousands being distributed, when they buy a pint of John Smith's. Karen Crowley, senior brand manager at John Smith's, said: "We know how much Brits love a lavish bone china commemorative plate at special times like this, so we thought we’d give John Smith's drinkers a special No Nonsense souvenir plate. "The design celebrates Prince William's marriage to Kate Middleton, whose family, like John Smith's, has strong Yorkshire roots, while giving a massive thumbs-up to the extra day off work that the nation is being given." Catch up on the other brands linking their marketing activity to the Royal Wedding on our dedicated page.